Win Tix to see “The Treasure of the Sierra Madre” on the Big Screen! In Select Cinemas Nationwide Sunday, Jan 14 and Tuesday, Jan 16! CMH is thrilled to announce the 3rd year of our partnership with Fathom Events — and the 1st of our 13 movie ticket giveaways for 2018, courtesy of Fathom Events! That said, we’ll be giving away EIGHT PAIRS of tickets to see “TCM Big Screen Classics: The Treasure of the Sierra Madre” – the timeless classic starring Humphrey Bogart, Walter Huston and Tim Holt — the way it was meant to be seen — on the Big Screen! In order to qualify to win a pair of movie tickets via this contest, you must complete the below entry task by Saturday, December 30 at 6 PM EST. We will announce the winner(s) on Twitter on Sunday, December 31, between 6PM EST and 7PM EST. If a winner(s) does not have a Twitter account, we will announce that winner(s) via this blog in the comment section below. About the film: Tampico, Mexico. Three down and out Americans pool the meager resources they have to follow a rumor of gold ore to be found somewhere in the Sierra Madre mountains. The three friends agree to split everything equally, but then they discover a fortune in gold ore… Academy Award winners Humphrey Bogart and Walter Huston star with Tim Holt in this classic tale of the cunning, greed and paranoia caused by The Treasure of the Sierra Madre. This 70th Anniversary event includes exclusive insight from TCM host Ben Mankiewicz. What is it about “The Treasure of the Sierra Madre” that makes it a Classic? And, if you haven’t seen it, why do you want to see it on the Big Screen? This entry was posted in Fathom Events, Posts by Annmarie Gatti and tagged Movie Ticket Giveaway, TCM Big Screen Classics Present The Treasure of the Sierra Madre. Bookmark the permalink. There is so much I love about this film. One of its most unique aspects is its surreal ability to portray deep intimate personal emotions against a wide open western vista! THE QUESTION: What is it about “The Treasure of the Sierra Madre” that makes it a Classic? And, if you haven’t seen it, why do you want to see it on the Big Screen? >>> I have never, ever seen “The Treasure of the Sierra Madre,” so what better way to see it for the first time than on the Big Screen! At a choice of TWO theatres near me! On the day before or after my birthday! 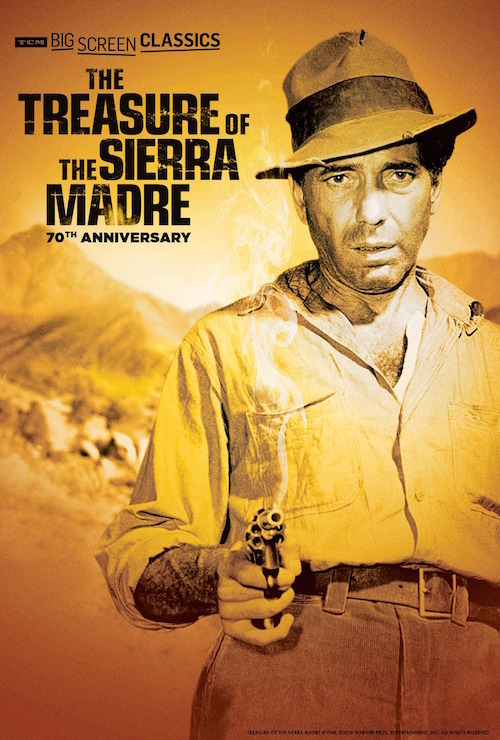 I have never seen “The Treasure of the Sierra Madre” but I want to see it on the big screen because it has Humphrey Bogart’s legendary performance as well as Walter Huston’s Oscar-winning performance as Best Supporting Actor of 1948. Also I want to see it because I’m a big fan of Tim Holt’s and I would like to see him for the first time on the big screen. The cast are all accomplished actors and many of the quotes have become immortalized in movie lore and history. The dialogue between Bogart and Houston and the gold-fueled madness that Bogart portrayed so well. One of my all time favorites! John Huston, Humphrey Bogart, Walter Huston – how could it not be a classic???? Actually, I think this is Bogart’s best performance as it shows his range, even more than The Caine Mutiny or The African Queen. It isn’t my favorite Bogart film (The Maltese Falcon – its a perfect film), but just watching him in Treasure, from down-and-out bum, to impatient prospector – tired and frustrated, to successful and happy-go-lucky, to dark, maniacal paranoid. Its impressive. I love Walter Houston telling the boys it was time to heal the mountain after getting their stake in gold. What a great triangle of actors with Walter Houston, Humphrey Bogart and Tim Holt. And also direction/screenplay by John Houston. I never get tired of watching it. We don’t need no stinken badges! What is it about “The Treasure of the Sierra Madre” that makes it a Classic? The Treasure of the Sierra Madre is a classic because it depicts a subject that, unfortunately, is timeless: The greed of man. We watch the film and think, “I would never be that way”, yet, the characters say the same thing and we are fascinated by the unfolding of events. One of the reasons The Treasure of the Sierra Madre is a classic is because of Bogart’s great performance. He does a great job of showing how greed transforms his character. Bogey automatically makes this a classic and it is one of the few movies I haven’t seen in its entirety. Bogart brought such a presence to the screen and it’s sad that the same can’t be said of most modern actors. I can’t remember seeing the full movie, just hearing about it mostly. It’s classic because it deals with some of the 7 deadly sins proving the more things change, the more they stay the same. We haven’t come far or really anywhere at all!! And really all the older movies are just grittier and unsugar-coated slapping you in the face with the way humanity still is so you can’t look away. ‘Greed is good’ — NOT! Looking forward to seeing it. Two of the many reasons why TREASURE OF THE SIERRA MADRE is a classic: it’s a timeless exploration of the corrosive effects of greed, and it’s John Huston directing his father to an Academy Award (while appearing in the film himself)! I really want to see Treasure of the Sierra Madre because I love Humphrey Bogart!! I remember watching this with my dad, I’d love to take him to see it in theater. Humphrey Bogart is what makes Treasure of the Sierra Madre a classic. Hi Emily, having a hard time finding your tweet. If you don’t have a twitter account, please let me know. Thanks! The line “We don’t need no stinking badges” is so ingrained in modern pop culture that I, and many people who have never seen the film, use it as if its just a made up meme. I would love to see its roots. From the great, award winning directing (and cameo) by John Huston, to the award winning turn by his father Walter, the great support by Tim Holt and Bruce Bennett, the quotable (and mis-quotable) dialogue, to the incredible performance (probably the best of his career) by Humphrey Bogart, this movie is the definition of a Classic Movie! This is a true classic because it touches on a subject that everyone can relate to….GREED. It’s timeless because gold still has the same allure as when the film was made and probably always will. It’s relatable to everyone because you can see in yourself something in all three of the main characters. Rare in any film from any era. It’s also a classic because it doesn’t hide anything from the audience. We know as much as the characters know, and as they change through the film we change with them. It was one of the first old movies I ever saw and the one that got me hooked on classic films. I think Howard is one of those characters that you get to know, see in people you know, and find yourself thinking in times of trouble , “ How would Howard handle this”. MOst of his speeches are just as relevant today as they where back then. ( I love his quote about water being more precious than gold, that is CLASSIC. The Treasure of the Sierra Madre is likely a Classic because of its cast led by the Great Humphrey Bogart. I want to see this film with my good friend as part of our research for a class paper on Western films. We are looking for patterns of representation, particularly of the sexes, in the genre and who is a better representative of classic masculinity than Humphrey Bogart? cuz I don’t need no stinkin’ badges. Total classic from acting to directing. My favorite actor of all time Humphrey Bogart who died on my birthday. This would be a party for me, one of his greatest roles on the big screen. I don’t have a Twitter account. Superb cast, especially Walter Houston, and some iconic lines we repeat quite a lot at our house! Why ISN’T the movie a classic!?? Directed by the great John Huston and starring a stellar cast, lead by the legendary Humphrey Bogart, it’s one of the greatest western/adventure films ever made. The cinematography is fantastic. The acting is fantastic. It rides on suspense that just keeps on going to the very end. It is truly one of the great Hollywood films of the era. One of my parents favorite dates, included going to see Treasures of the Sierra Madre. It would be lovely to win, so I could give them tickets as a belated 42nd anniversary gift. Oh that’s such a WONDERFUL reason 🙂 Thank you so much for entering and Good Luck! When I fell in love with classic Hollywood movies, I came across Humphrey Bogart in Casablanca and then ultimately fell in love with all his movies with Lauren Bacall. It is a shame that I have not seen a lot of his other movies. I would really be grateful to win the tickets to expand my love for a man that is the epitome of my love for classic Hollywood. My father says that everything about this movie makes it a classic. The setting, the actors, the use of black and white. I want to treat him to a showing, as it’s his favorite movie. Humphrey Bogart and Walter Huston definitely make “The Treasure of the Sierra Madre” a Classic! Their acting is superb. I would love to see this on the bug screen! Walter Houston for the win! He is fantastic in Treasure. I’d love to see him on the big screen. There are too many reasons why Treasure of the Sierra Madre is a classic, but I’ll try naming some anyway! First things first, Max Steiner’s score. One of the best movie composers of the era, and he provides an exciting score to back the film. Steiner never fails to deliver. And then there’s Bogart, of course, in probably my favorite role of his as Dobbs – delightfully unhinged, that guy. And another thing I have to mention is the setting – Mexico! The mountains! The crowded streets of Tampico! I love a good western, and from the the setting and story (prospectors south of the border, bandits and robberies) I consider this a western. Therefore, it’s one of my favorite westerns. Everything really comes together beautifully in this film —- the score, the performances, the setting — one of the damn finest Huston films, scored by one of my favorite film composers, and starring Bogart, Walter Huston and Tim Holt! It’s one hell of a combination. Treasure of the Sierra Madre is a classic to me because it chronicles the pathway to madness from greed, it is one of the first films filmed on location, and it is directed by John Huston. What makes a classic? A good story, well-told, that stands the test of time. There are so many factors that make The Treasure of the Sierra Madre a classic. Start with a great story, add a phenomenal director, a brilliant cast, and a dramatic location, and push it all to the extreme. I would love to take my husband to see this film the way it was meant to be viewed, on the big screen! I do not have a Twitter account, so I am posting here to enter but cannot tweet the message. To me, John Houston directing his father in an academy awarding winning role is a point. But the story itself is classic as we watch Humphrey Bogart spiral down ti depravity because of greed… classic! It’s the perfect non-western. Its themes are classic, the direction is perfect and we all remember how wonderful the acting was…should have won more Oscars. Great performances and excellent direction by Huston. Watching and listening to this movie is like attending a first-rate film school. Humphrey Bogart is a Classic actor and any film he adds his talent to is deemed a classic. The direction of John Huston just keeps the film moving along so it keeps your attention from start to finish. And the classic dialog is the best!!! I am ashamed to say that I have never seen this film! I would love to change that and I can think of no better way to do so than to see it on the big screen! I have never seen the Treasure of Sierra Madre but have been taking my kiddo to see classic movies and I think this Bogart classic would stick with my kiddo forever. Thanks! I hope to see the movie. From the set to the direction, acting and writing, It must have been bittersweet but a phenomenal opportunity for writer director John Huston to have his father and best friend in such a rare vehicle. A once in a lifetime chance and a last movie for his dad. There are a lot of twist and turns moral decisions and in the end it challenges us all what it means to be truly rich. This story and movie never gets old. Seeing it with close family on the big screen would be a fantastic way to share it with loved ones. Hi J, I can’t seem to find your tweet. If you don’t have a twitter account, please let me know. Thanks!